Do you have trouble remembering what you read? Do you start projects but never finish them? Do you struggle with math? A poor working memory could be to blame. To help fix these problems, make your working memory stronger! 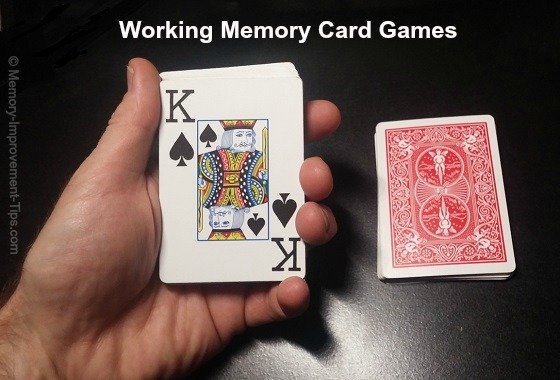 A fun and effective way to improve your working memory is to play working memory card games. All you need is a deck of standard playing cards or a deck of Blink cards . You can use either type of cards. 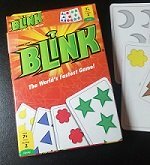 Below I explain how to play three working memory card games using the Blink cards or the playing cards. These are solitaire games, so you don't even need a partner. And don't worry, the rules are simple to learn. Give these working memory card games a fair shot, and practice every day for 8 weeks. Then notice how your working memory has improved! The three working memory card games explained below are played with standard playing cards or using a deck of Blink cards, if you have those. You don't need a computer to play them, just the deck of cards. The names are descriptive reminders of the rules for each game. The rules are explained in more detail below. If you have Blink cards, watch the following 2-minute video. It explains how to play the "Number, Color, Shape" working memory game using a deck of Blink cards. For instructions on how to play working memory card games with regular playing cards, see below. The video above was made by Carol Brown, an expert on working memory and cognitive training. In addition to "Number, Color, Shape", you can also use Blink cards to play the "Number, Number-Color, Number-Color-Shape" and "Plus One, Minus One" working memory games. See below for the rules for those games. Those games use the same rules as with regular playing cards below but with slight modifications for Blink cards. Below are the rules for playing working memory card games. I've explained them for Blink card and for standard playing cards, whichever you want to use. For each of these games, hold the deck face-up in one hand, then place the cards down one at a time on the table. With Playing Cards: To prepare the deck for this game, remove the Jokers then shuffle the deck. Hold the deck face-up in one hand. Start dealing one card at a time face up on the table. As you place each card down, say out loud the number, color, or suit of the card. For the first card, say the number. For the second card, say the color. For the third card, say the suit. Then repeat this sequence. For example, suppose the first 5 cards are 5 of Spades, Ace of Clubs, 8 of Hearts, King of Diamonds, and 10 of Spades. Out loud, as you set down each card face-up in a pile on the table, say "five", "black", "Hearts", "King", "black". Repeat as you go through the rest of the deck card-by-card. Over time and with practice, try to go faster while remaining accurate. 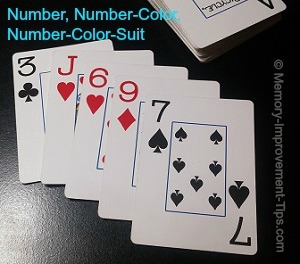 With Playing Cards: This game is similar to Number, Color, Suit but a little more challenging. For the first card, say the number. For the second card, say the number AND the color. 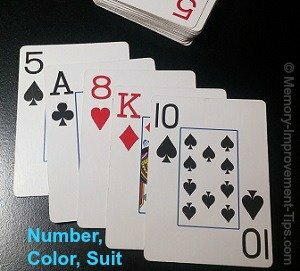 For the third card, say the number AND color AND suit. Repeat this sequence for all the cards in the deck. Try to go faster as you get better at the game over time. For example, suppose the first 5 cards are 3 of Clubs, Jack of Hearts, 6 of Hearts, 9 of Diamonds, and 7 of Spades. As you set down each card, you'd say, "three", "Jack-red", "6-red-Hearts", "nine", "seven-black". 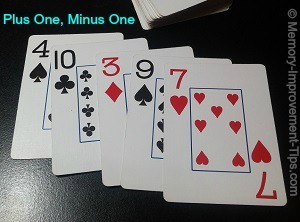 With Blink Cards: The game is "Number, Number-Color, Number-Color-Shape" (not suit) when played with Blink cards. The sequence is number of objects, then number AND color of the objects, then number AND color AND shape of the objects. 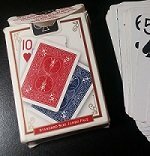 With Playing Cards: This game uses the number cards 2-10 only. Prepare the deck for this game by removing all face cards and Jokers then shuffling the deck. As you place down each card, add one or subtract one from the card's value. Alternate adding and subtracting as you place the each card on the table. For example, suppose the first six cards you deal are 4-10-3-9-10-7. In your mind, add +1 to the first card, -1 to the second card, +1 to the third card, and so on. The suit isn't used in Plus One, Minus One, so you can ignore the suit. The idea is to perform this mental addition as quickly as you can while remaining accurate. Over days and weeks of practice, try to increase the speed at which you deal the cards. By the way, if you want more practice with mental math, check out the free online math games here on my site. With Blink Cards: Numbers aren't displayed on Blink cards, but you can still use them to play the Plus One, Minus One game. Simply count the number of shapes on the card and use that as the number to which you add one or subtract one. Keep a deck of cards in your car, backpack, purse to play the working memory card games in free moments during your day. It takes time for the brain to strengthen, so make sure to play the games every day for at least 8 weeks to notice improvement. And if you child is having the same trouble with reading comprehension, projects, or math, have them play the working memory games too. The earlier a person who has a poor working memory can begin to strengthen it, the more success they'll have in life. Important: It's very helpful if you say the card values out loud as you play the games. This gives an extra boost to the effectiveness of the working memory training. I learned about the working memory games above through the work of Carol Brown, a special needs consultant and working memory expert at Equipping Minds, a cognitive skills training company. If you or your child have learning challenges, you might want to check out their services. I am not affiliated with Carol Brown or Equipping Minds and receive no compensation from her or her company.